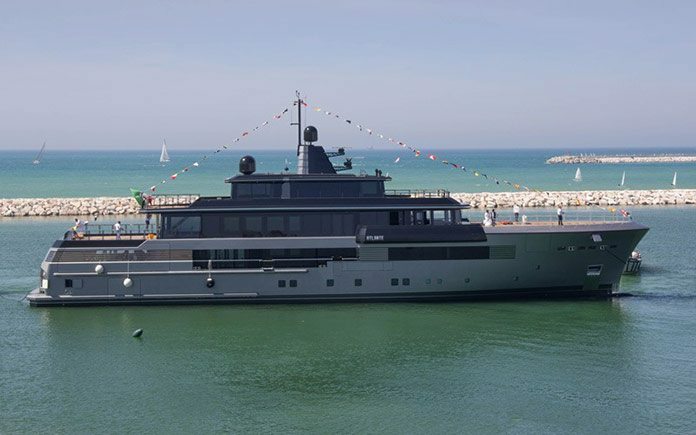 CRN, the shipyard specialising in the construction of steel and aluminium yachts between 50 and 90 metres in length, held a private ceremony on May 9 to launch its hull No. 134 – a 55-metre megayacht that stands out for her very strong, unmistakable personality. This luxuroius yacht is the outcome of the outstanding job performed by design firm Nuvolari Lenard, that pencilled her outer lines, and CRN’s Engineering Department, which was in charge of naval engineering. The CRN 55m M/Y ATLANTE combines the efficiency of industrial production with typical world-class Italian craftsmanship – the heritage of Italy’s centuries-old yachting tradition. Nuvolari Lenardi had already successfully cooperated with the Shipyard on several megayachts, including 43-metre ‘Magnifica’, 46-metre ‘Clarena’ and ‘Saramour’, and 72-metre ‘Azteca’. “Launching a new yacht is always a moment of great pride for the entire Shipyard…as emotions go hand in hand with the satisfaction of knowing that each and every one of our products is going to represent our brand and Made-in-Italy yachting across the world’s seas. Entirely built in Ancona, this yacht can boast a purposely strong stylistic identity, which draws inspiration from some elements typical of military crafts: square shapes, sharp lines, and innovative, sophisticated design solutions – these are the distinguishing features of the Ancona-based shipyard’s brand-new yacht. The ’ATLANTE’, 55 metres long and having a 10.20-metre beam, develops over 5 decks featuring strikingly original solutions. The ‘ATLANTE’ is equipped with two 1230 KW @ 1800 RPM CATERPILLAR engines that push her to a maximum speed of 15 knots and a cruising speed of 14 knots. CRN is a member of The Ferretti Group – world leader in the design, construction and sale of motor yachts and pleasure vessels, with a unique portfolio of prestigious and exclusive brands: Ferretti Yachts, Riva, Pershing, Itama, Mochi Craft and Custom Line.